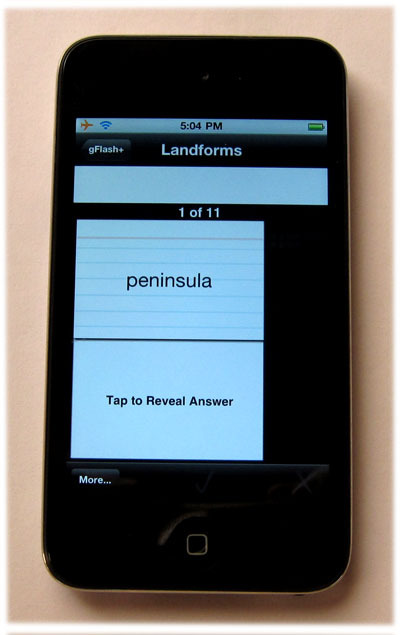 The Kids Open Dictionary now has an option to create mobile flashcards using gWhiz. This free app supports the iPhone, iPad, iPod touch, BlackBerry, Android, and more. Use the glossary builder in the Open Dictionary to create your set of words and definitions. Go to the gWhiz Flashcard Template form. NOTE: You need a Google Docs account to proceed. Fill out the form, and then proceed to Google Docs as instructed. Save the document as a copy with the name you’d like to appear on your mobile device. Open the CSV file you created above. Copy the cells from the CSV file and paste them into the Google Doc template. Save and close the Google Doc. Go to gWhiz on your mobile device. From the menu, select Get My Google Data… Select the file for your flashcards and download. Here are more instructions on this and some advanced features like adding pictures. Special thanks to Matt Renfroe for requesting this feature. If there’s something else you’d like to see in the Open Dictionary, let us know, and we’ll see what we can do!